After Jeni posted 2 gorgeous quilts made with HR Medocino fabric and Darci made one (and another is in the works) for her daughter (watch the video, so cute! ), Kelly was inspired to sew with some of her Mendocino and HR fabric. 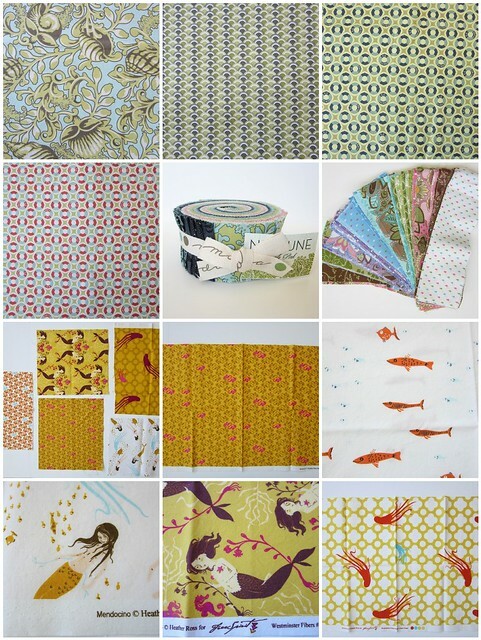 And if you aren't into the fabric world, Mendocino is highly coveted. This evolved into sewing with all your precious fabrics. Enter the My Precious QAL. And as Michelle learned last night, I have been holding out on you. I *may* have a large fabric stash that includes OOP, HTF fabrics. Like Mendocino, Neptune, and Macaroni Love Story. I'll be listing fabrics throughout the weekend in my Etsy shop. I have quite a bit that I want to destash, not all HTF, so it will be a long process. Here's a preview of what's to come. Awe thanks Ali and here I thought you didn't like kids :) I can't wait to make this 2nd quilt.